Floyd Mayweather has revealed he would be willing to give Manny Pacquiao a rematch next year. The 38-year-old won a comfortable points decision over Pacquiao in the fight of the century in Las Vegas on Saturday. But since the showdown at the MGM Grand, it emerged that the Filipino had a shoulder injury that required surgery. And Mayweather, who took his perfect professional record to 48-0, told ESPN that he would be open to another fight with Pacquiao after his surgery. 'I will fight him in a year after his surgery,' Mayweather told ESPN reporter Stephen A. Smith in a text message. The unbeaten American had previously said that he would fight one more time in September before retiring from the sport. One more victory would take Mayweather to 49 wins, level with legendary unbeaten heavyweight Rocky Marciano. 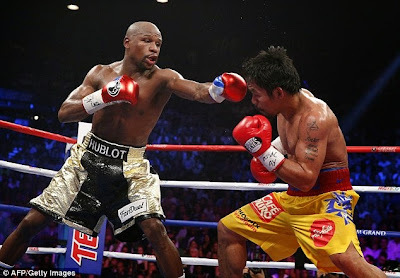 Although Mayweather claimed that record did not matter to him, the opportunity to notch up a 50th professional victory and earn another huge payday against Pacquiao may tempt him to rethink his September retirement plans.